The substance of the following was given in the form of an address, at the service of dedication of a tablet in memory of Mr. Crothers, in Unity Church, St. Paul, Minnesota, Sunday, December 8, 1929. ON AN AUGUST Sunday morning in the year 1886, a young minister stood before a small congregation in the city of St. Paul, Minnesota, to preach a trial sermon. He was twenty-nine years old, though he looked nearer nineteen; and in spite of his diffident manner he already had behind him ten years of experience as a preacher in Kansas, Nevada, California, and Vermont. As he faced this new congregation in Minnesota, the thought of his earlier adventures in so wide a range of churches must have helped to give him confidence. He needed all the confidence he could muster, for this congregation had high standards by which to judge his efforts. Fourteen years before, a group of men and women, most of whom had been brought up in eastern Unitarian churches, had decided that there ought to be a church of that denomination in St. Paul; and, with characteristic determination, they had proceeded to carry out their purpose. They had already had three ministers, of whom one had stayed for seven years and had left upon the young society an indelible impression; and the young candidate must have realized that his fitness for the pastorate of Unity Church would be largely determined by comparison with this one among his predecessors. It would be difficult to imagine a greater contrast than that between William Gannett and Samuel Crothers. One of them had been born in Massachusetts, the other in Illinois. One had been educated at Harvard, the other at Princeton. One represented, by birth and nurture, the finest traditions of Boston Unitarianism; the other was a child of Scotch Presbyterian stock, reared on the Westminster Shorter Catechism, and imbued, from his earliest days, with the doctrines of John Calvin and Jonathan Edwards. From the point of view of a Unitarian church, William Gannett had been born to the purple. His father had been the colleague and successor of the great William Ellery Channing, of the Federal Street Church; and if the younger Gannett had broken away from the family tradition both in his more radical thought and in his decision to go west, he none the less belonged in the very innermost circle of New England Unitarianism. 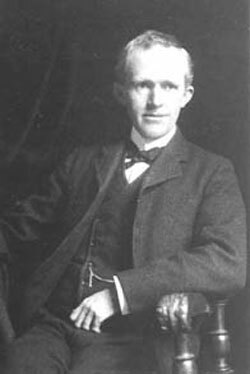 Samuel Crothers, on the other hand, had come out of the Presbyterian fellowship only a few short years before; his standing among the Unitarians was still questionable. Gannett was a rebel and a poet. Crothers was neither. The process by which he had outgrown the theology of his Presbyterian ancestry and birthright had had nothing violent about it, nothing sudden or revolutionary, and his imaginative power, greater than Gannett’s, lay in another field than that of poetry. Almost the only thing the two men had in common was a passionate desire to make religion a reality in the lives of their fellow men. Aware of this divergence of gifts and experience what sort of sermon could the “come-outer” preach, to win the sympathy of a congregation so recently under the powerful influence of a “horn and bred” Unitarian? We know very little about it, for Mr. Crothers never used a manuscript after his student days, and he left behind him no notes for this particular sermon. We do know that it was a success, for it led to a call that was accepted and that inaugurated a seven year pastorate. But of the sermon itself we have only a single paragraph, happily preserved by the church chronicler. Yet that paragraph is enough to explain why he received the call, and those of us who knew him in the days of his maturest power as a preacher can detect, in its sentences, the ring of conviction and the daring reach of thought that made him one of the great teachers of religion in our time. Surely nobody listening to those words could doubt for a moment that the man who spoke them belonged in the pulpit of a free church. The chrysalis of orthodoxy had been wholly left behind, and a free mind was testing its wings for flight toward new and more significant truths. If this man was a “come-outer,” he had most certainly come the entire distance. Yet there was nothing disillusioned or despairing about his radical words, nothing suggestive of the pale negations of liberalism. His mind was free, yet plainly constructive; daring in its intellectual venture, yet courageous and confident. Is it to be wondered at that the St. Paul Unitarians called him, or that they still take pride in the fact that he accepted their call? During the years of his ministry among them, they watched his mind develop and his powers of utterance grow from week to week, and when he left them to become minister of the First Parish in Cambridge, they continued to watch his career, convinced that all his greatness was but the natural outgrowth of the young hearted preaching they had known and loved in St. Paul. The world knew Mr. Crothers chiefly as a lecturer and essayist, and it isn’t strange that his reputation as a preacher should have been thus overshadowed. He could never have been a “popular” preacher in any period, and the times in which he lived were peculiarly unfavorable for really first rate preaching. He knew nothing of the “art of homiletics” and would have scorned to practice it, had he known it. The tricks that sometimes, even today, fill a church with people who enjoy listening to a series of anecdotes strung on a slender chain of mildly religious argument, would have seemed intolerably cheap to him. He took for granted that the members of his congregation had brought their minds to church with them, and that they wanted to use them as actively as he used his. Careless listeners got little from his sermons, and casual visitors, who heard him only once, were apt to go away unimpressed. But those who heard him Sunday after Sunday, through the years, came to regard him as a preacher of amazing power. They would willingly let all the essays slip away into oblivion, if that were the necessary price to pay for keeping the picture of his gentle figure standing in the high white pulpit of his Cambridge church, with the light of spiritual knowledge and passion shining through his eyes, and for hearing the voice that, on so many occasions, uttered, what were for them, the words of eternal life. The secret of any great preacher’s power is as elusive as the secret of personality. Essentially, I suppose, the two secrets are the same, for a great preacher must be a great personality. But method has much to do with it, also, and method can be more easily analyzed. The students at the Harvard Divinity School used to be told by their instructors to “go and hear Crothers preach, but never, under any circumstances, try to preach the way he does.” The warning was salutary, for many a young theologian began his career as a slavish, though usually unconscious, imitator of the minister of the old First Parish across Harvard Square. Some of us took years to get over the habit, for we imitated even the intonations of his voice. But in a more fundamental sense, I think the advice was bad, for the method of preaching Mr. Crothers used is the only one that is likely to be fruitful when one is preaching to modern minded people. It may not attract the crowd, but it will attract educated men and women, and it will feed their souls provided the man who uses it is a preacher of genuine native ability. For those who wanted to be told what to believe such preaching was, of course, wholly unsatisfactory. None of the dogmatists, whether conservative or radical, could get much from such sermons. But for those who looked upon religion as a quest, this frank acceptance of the “university point of view” in religious thinking was most reassuring. It broke down, at the outset, the barriers of artificial authority that still often hedge about the preacher. It was a public repudiation of the whole set of ideas that have made the pulpit often called a “coward’s castle.” Here was a religious teacher to whom a thoughtful, independent minded man could listen, without compromise or mental reservation. Here was a preacher who claimed nothing for himself, except that he was telling, with perfect candor, what seemed to him true and important things about life, as he had found it.loft. As he talked, he seemed like one of the characters in Bunyan’s Pilgrim’s Progress a book which he knew almost by heart, and from which he used to quote almost every time he spoke. After Christian has been led astray by Mr. Worldly Wise man, and brought back to his true pilgrimage by Evangelist, he is told to stop at the Interpreter’s House, where he will be shown many excellent things. Christian follows this counsel, and is entertained by the Interpreter, with genuine cordiality. His host takes shim into the “significant rooms” in his house, and tells him the meaning of what he sees; after which, Christian goes on his way, enlightened and encouraged. Well, Mr. Crothers was just that kind of Interpreter, and every time we heard him preach, we felt as though we had been in the Interpreter’s House. He knew how to make us feel at home with him, and he knew how to show us significant rooms in his house by the pilgrim way, so that we too could go on with fresh courage and assurance. The hospitality of his mind was freely given to anyone who had the wit to seek it, and those who entered the doors which he held open for them, found, within his dwelling, an interpretation of life that restored their souls. To serve men, in that fashion, requires very special gifts and the widest possible range of human experience. The Interpreter must know life in all its aspects, and his heart must instinctively comprehend all sorts and conditions of men. He must have traveled far and wide through the kingdoms of the earth, and in imagination he must have lived in every land and in every age. And then he must have, in supreme degree, the skill that will enable him to bring to each individual in need the refreshment, the wisdom, which his own experience has brought to him. Such Interpreters appear but seldom among men, and Mr. Crothers was one of them. Let us look together at a few of the significant rooms in his house, into which he has taken us, and from which we have come forth, renewed in spirit. Over the door of one of the larger room son the ground floor appeared the legend “Geography chiefly American.” The room was filled with pictures, maps, and miniature models of all sorts, collected from all over the world, and assembled without any apparent system or purpose. As you looked at them, you suddenly became aware of the fact that there was magic in this room, for the various objects moved about and fitted into one another in a most extraordinary way. The maps, especially, were alive with motion and gave you the impression that you were not so much looking down at them as actually standing in the places indicated upon them. Mountains, plains, rivers, hamlets, cities instead of being marks upon the paper, they were all, for the moment, as real as you were, and each scene, as you looked at it, made you feel as though you had lived in that particular spot all your life. You felt at home in each place, and yet you were always conscious of the existence of all the rest of the world. Your view was parochial and planetary, at the same time. After you had gazed for a while at the map sand objects in the room itself, the Interpreter took you to a window that looked out over the surrounding country. It was his American window, and, as you looked out, you beheld a constantly changing panorama of American life. The same magical quality that belonged to the contents of the room was found in the view from the window. At every moment you felt as though you were standing in the very center of what you were looking at. Each individual scene was as vivid as though you were actually a part of it, and yet you never lost the sense of the continental sweep of America, as a whole. And the magic had the further effect of giving you a sense of history as well as of spatial extension. The past was as living as the present. At one moment you were in a mining camp high up among the peaks of the Rockies; at the next, you were on the plains of Nebraska, with the great sweep of an unbroken horizon encircling the vast fields of wheat and corn; then, with disconcerting abruptness, you were climbing a stony New Hampshire hillside, looking down upon a little village, with green and white houses, and a lovely church spire rising from beside the common. In one flashing instant you saw the early settlers on Cape Cod, toiling and worshipping, yet finding life a much more delightful experience than you had ever supposed those rather grim Puritans and Separatists knew enough to appreciate; then it was the indomitable migration of the Mormons across the central prairies, until they reached the freedom and promise of their new home in Utah; and then it was the little homesteads of Illinois and Iowa and the Dakotas little only in the apparent insignificance of any one household amid the vast extent of the fertile plains, but great in the implications of what human skill and courage could achieve. And all of it was America that was the constant background of everything you saw all of it America, and all of it yours, because you belonged to America, and because all of America belonged to you. I remember well the last sermon I heard Mr. Crothers preach. He had just come back from Utah and a trip through Zion National Park, and he was full of enthusiasm over its beauty and grandeur. He told us how he had been struck by the names given to the various masses of rock that constitute the most impressive features of that desert religion such names as “The Temple,” “The Great White Throne, “The Altar of Sacrifice.” At first, he had been puzzled to find biblical names attached to such strange freaks of nature; but then he remembered that the religion which produced the Bible had come out of the deserts of Syria and Arabia and Mesopotamia. And so the sermon became a study of the influence of the desert of great, open, barren stretches upon the soul of man, and of the perennial need to renew our sense of contact with this source of spiritual insight. The cool white meetinghouse was transmuted that morning into a room in the Interpreter’s House, from which we journeyed into far places where the human spirit first came to a knowledge of its kinship with eternal realities. Everywhere in that room you saw America at work, and everywhere you suddenly began to see the idealism behind the struggle. The idealism of the doctors, of the social workers, of the teachers, of the farmers, of the miners, of the business men, of all Americans, even when they supposed they were only concerned with the mad scramble for the almighty dollar under the spell of the Interpreter’s comment you saw it all very clearly, and believed in it with sudden, passionate conviction taught us to see it, was too big a thing to descend to petty or prejudiced tactics. It was as broad as the Great Plains and as lofty as the Sierras. You had to climb a long flight of stairs before you came to the room over the door of which was inscribed “Members of One Body.” The moment you entered it, you knew you were in a church, but what kind of church it was you could never finally decide. Sometimes it seemed as unadorned as a Wee Free kirk or a Quaker meetinghouse; sometimes it was filled with the incense of a Roman Catholic cathedral. The windows were sometimes ablaze with the glories of Chartres, and then it would seem as though the colors were merely the gorgeous hues of a sunset, or of autumn foliage seen through the plain glass of a Puritan church. It was all very puzzling at first, but after a while you began to understand what the Interpreter was trying to make you see and feel. As he talked with you about the history of religion, all your prejudices slipped away. He made you see the sincerity sometimes, to be sure, the sad sincerity of every search for religious consolation and power. He revealed to you the truth in every formulation of religious belief, no matter how crude or dogmatic or presumptuous. He understood, and in a measure taught you to understand, all the passion for truth and righteousness that lies behind the labels we use so glibly and often so stupidly Catholic, Calvinist, Methodist, Mystic, Rationalist, yes, even Atheist. He had been a good listener to them all; and though he always had his own personal convictions, he never lost his ability to hear the authentic voice of religion speaking in the strangest of her many dialects. “Members of One Body” he called them, and so he always thought of them. Many other rooms there were in that amazing house, but we must be content with a few words about only one more. It was high up, near the top of the house, where the sounds of the busy street were almost lost. When you went in, the place for its label was empty of any lettering; but when you came out, and glanced back at the closing door, you saw upon it your own name. Searching though the rebuke may have been it never stirred you to self-defense or to resentment against the Interpreter. What he said was so plainly true, and so plainly kind in its intent. Nor did he ever send you away discouraged. He had so high an estimate of what you might become, so much confidence in your power to do what you ought to do, that you came away filled with determination to justify his faith. If he believed in you, how could you help believing in yourself? If he had found the world a good place in which to live, and life itself an infinitely varied and delightful experience, somehow you could not admit that you found them anything less. “Rectitude serenity joy; and the greatest of these is joy.” With those words ringing in your ears, how could you maintain your “defeatist” philosophy? Perhaps you tried to resist for a few minutes. And then you saw him looking at you, a little shocked and a good deal amused by your stubborn folly. And so you laughed at yourself, and went along, and tried again. This eager sense of expectancy may have come, in part, from his evangelical heritage, as the intimate knowledge of the Bible surely did; but his was very far from the traditional Christian confidence in the coming of the Kingdom of God. His spirit had ceased altogether to be dependent upon the guarantees and certain ties of manmade theologies. He put no trust inhuman efforts to map out the course of events and diagram the route to the heavenly places. His was a far deeper trust than that, for it was trust in the process itself, in the growing wonder and beauty of creative experience. He felt himself part of a mighty enterprise, so vast in its scope and so tremendous in its all inclusive sweep, that all our human efforts to bring it within the bounds of a neat little system of thought were patently absurd; and yet, because he felt himself part of it all, because he felt at home in the world, he dared to trust what he could not hope to understand. Only a soul that has kept its child like quality could face the unknown with such perfect confidence, but it is not enough to keep a quality with which one is born. Something must be wrought out by one’s own experience and added to one’s birthright. The rectitude and serenity and joy with which Mr. Crothers faced life were those of a soul that has won freedom for itself a soul utterly free, yet mature and wise in its liberty. I wish some one of his old friends might have gone to him in the days of his ripest powers of mind and heart, and asked him his own question of the early St. Paul sermon. “What foundation have you for a belief in God and Immortality?” Without the slightest hesitation, I believe he would have given the same answer. “I have none.” But then he would have gone on to say, with his disarming and reassuring smile, “But what need is there for a foundation? The earth is not sustained by a foundation, but is impelled through space. What need has a free spirit for a solid rock on which to stand, when it has wings with which to fly? What need has a full rigged ship for moorings in some sheltered harbor, when before it lie the perils and glories, the storm sand exultations, of the open sea?